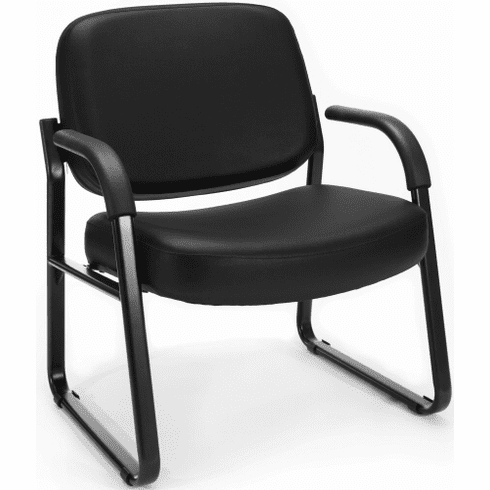 This big and tall vinyl guest chair with arms, from OFM, features a tubular steel frame with a 23" wide seat. Other features include a thick 4.75" molded foam seat cushion, a thick foam padded, fully upholstered backrest, easy care vinyl upholstery that's available in (5) different colors, stable sled base that glides over carpet and frame integrated armrests with urethane pads for added comfort. 400 lbs. weight capacity. This vinyl guest office chair meets or exceeds ANSI/BIFMA safety standards. Dimensions: Seat Size: 23"W x 21"D. Back Size: 23"W x 17.5"H. Seat Height: 18"H. Overall: 35"H x 27.5"W x 28.5"D. Weight: 46 lbs. Limited lifetime warranty from OFM. This chair normally ships within 1-2 business days.